A subtle, natural look, mimicking thousands of tiny eyelashes with the implantation of pigments in the lash line is popular with both male and female clients. Additional shadowing of color can be added for a soft natural liner or a more bold, definite line can be achieved, or eyelash extensions may be applied for even more enhancement. Ophthalmologists recommend Intradermal Cosmetic procedures for those who are allergic to conventional makeup and for those wearing contact lenses. Everyone can now experience, longer, thicker, darker lashes. With patented "CAREPROST" (bimatoprost ophtalmic) solution you will see results in 30 days. Eyelash extensions create a longer, thicker and fuller look that almost every woman desires because more attractive eyelashes get noticed! 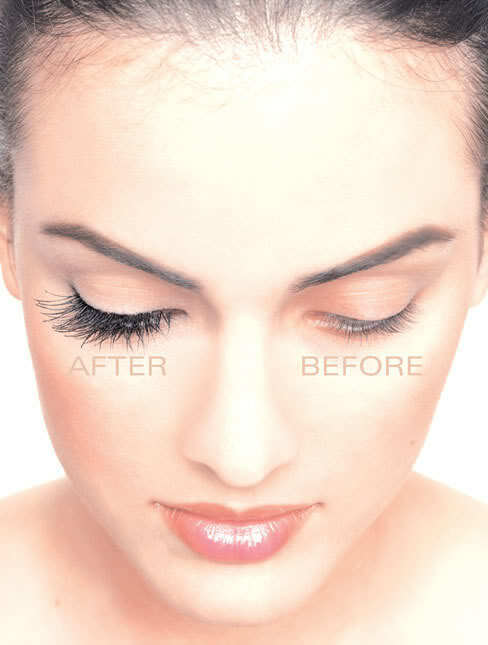 Eyelash Extensions are worn by almost every female celebrity. Longer and fuller eyelashes will comlement your permanent eyeliner. No mascara needed! Get more of permanent beauty, get more convinience and save time in the morning! Safe in the gym or swimming or other sports. Low cost on monthly touch ups. Watch video on Youtube, go to VIDEOS. Topical anesthetics and latest technique are used to minimize discomfort. Definitely! There’s a wide spectrum of colors you may choose from, or technician will help you to match color to your color complexion. There will be slight swelling and redness in the skin, which will subside quickly. You may resume normal activities immediately after the procedure. Complete full effect takes one to six weeks while the pigmentation matures and reaches its final color.